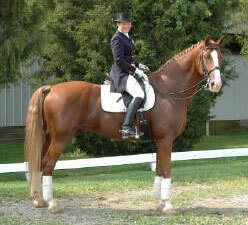 Intendo was a Dutch Warmblood imported from the Netherlands in 1997. He was a 16.3 hand chestnut gelding with 4 white socks and a blaze. Julie's journey with Intendo began in December 1996 when she got a call from her trainer, Michael Barisone who was training in Germany, to come to Holland as he had found several horses for Julie to try out. They looked at several horses but Intendo was the one she literally "fell in love with" when she saw him. Intendo was competing at 3rd level in Holland at the time. Intendo has been considered as "stallion prospect" since the day he was born. He went to the stallion testing in 1993 and of all the 900 horses presented at the time, he made the top 50. Luckily he did not qualify to remain a stallion (as the Dutch system is very stringent) or Julie would have never been able to purchase him later. Intendo went on in his career in Holland to become the top "Five Year Old" of the entire country in 1995. Intendo was imported via Miami, Florida in January 1997 where they continued to train and show in at 4th Level winning many classes. They also continued competed at the Devon Horse Show ("The Show Where Champions Meet") winning Reserve Championship with over 100 horses entered and also first place in the 4th Level Test 3 Class with a high score of 73% - a most notorious award! Intendo was also third in the country in the USDF (United States Dressage Federation) Horse of the Year Awards in 1998 and 3rd in the country for the Dutch Warmbloods Awards as well, out of hundreds of horses entered. Intendo and Julie have continued to move up the levels competing successfully at Prix St. George and Intermediare I, winning many awards in the Midwest and Florida as well as becoming the Northern Ohio Dressage Association high point FEI Champion for 1999, 2000, and 2002. Intendo's sire, Darwin, became the leading sire of Federation International Equestrian (FEI) dressage horses in 2000 as a result of Intendo and 2 other horses that were the most successful competitors in the nation that year. Over the years, Intendo and Julie were invited to Merrill-Lynch Hunter Jumper Classic in Cleveland to participate in their exhibition before the jumping event. Intendo was able to "strut his stuff" and show off his fancy dressage movements to a cheering crowd. Intendo also has FEI International passport so he can compete in internationally sponsored events. Intendo has also become very famous being featured in many horse publications and newspapers. Intendo was featured in the Hunter & Sport Horse Magazine in the March / April 2003 issue in the article "Getting to Grand Prix - Is Your Horse a Future Prospect". There was a picture of him competing labeled as an excellent top grand prix prospect. Intendo was also featured in the Dressage and CT magazine for the April 1997 and the May 1998 issues for an article written by Michael Barisone on "The Foundation of Collection" using Intendo as a role model. Intendo's retirement was spent at North Crest, were he presided over the barn, always in the first stall. For years, he schooled young riders, and as long as his health permitted, he had a daily workout.